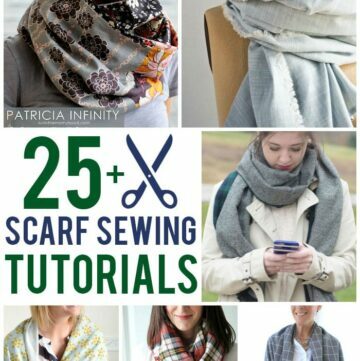 Learn how to make an infinity scarf with this free sewing pattern! 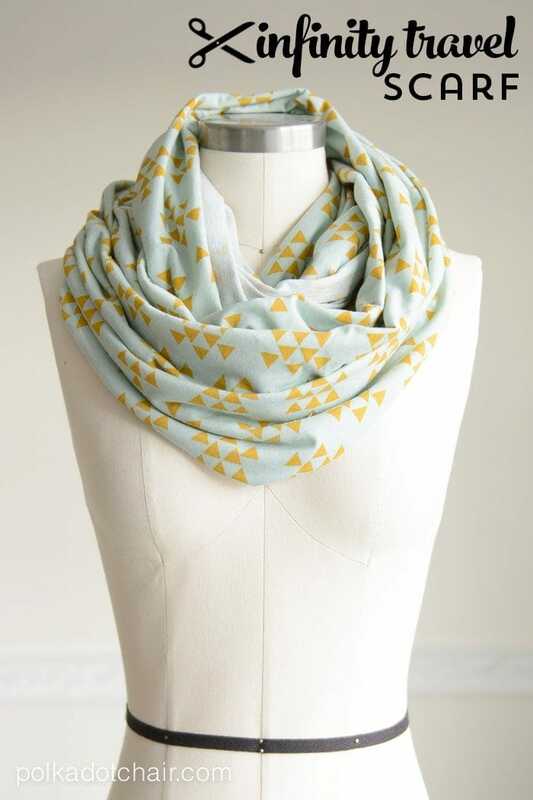 This infinity scarf pattern is special, it does double duty as a travel scarf. Keep reading to find out more! 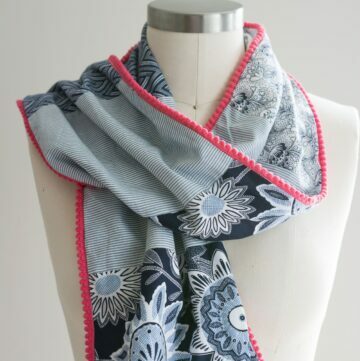 If you like this post you may also enjoy this Pom Pom Scarf sewing tutorial and this Custom Printed Fabric Infinity Scarf. 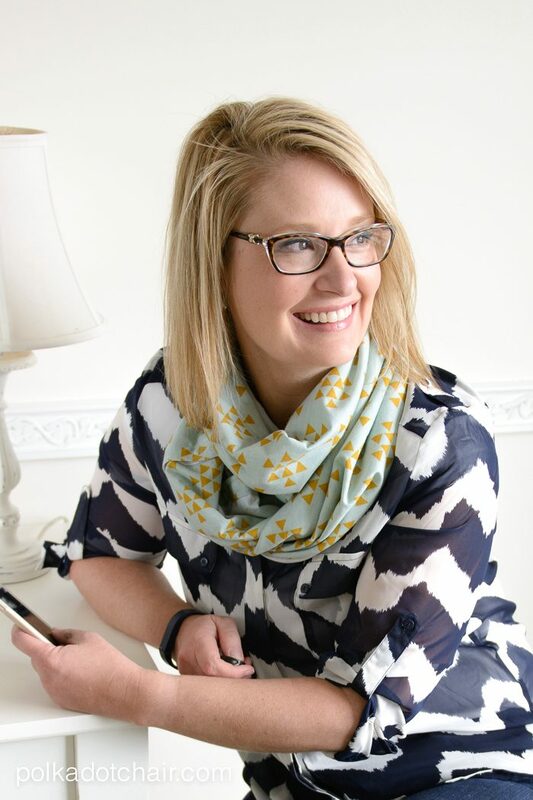 Today I’m going to share with you a tutorial on how to make one of my “go-to” travel items, a snap-up infinity scarf. I purchased a similar scarf at a very popular athletics store a few years ago and drug it around everywhere with me. 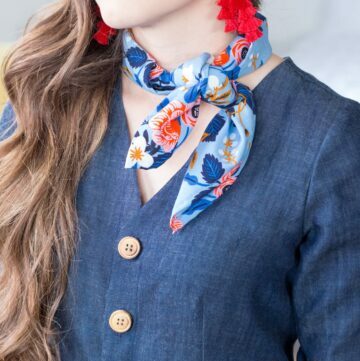 I love this scarf because it is perfect for road trips and airplane rides. When snapped up the scarf just looks like a normal infinity scarf, but unsnap it and you have a blanket for an airplane or a shawl for long car rides. Mine goes with me every time I travel. When it was time for a new scarf I decided that instead of purchasing a new one, that I would just make one instead. I especially love it when I’m traveling during the summer and it’s too warm to take a blanket or coat on an airplane. Those planes can get very cold! You can even adjust the snaps so that it doesn’t fall off of you when you move around on the plane. 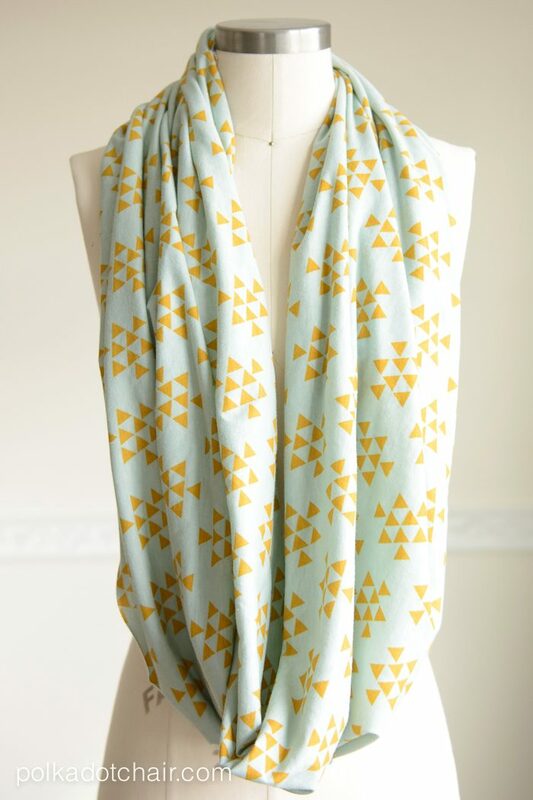 This scarf is made from Jersey Knit fabric, you could also you a Ponte Knit or a Cotton Lycra Knit. Not sure what I’m talking about? Check out this post on my blog that explains what the different types of knit fabrics are, and what they are used for. 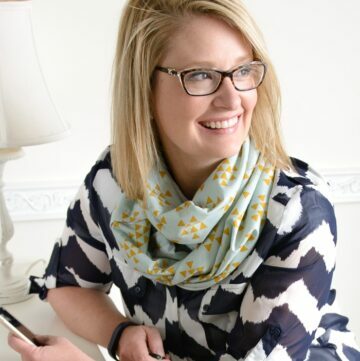 With all of the cute knit fabrics on the market now it should be easy for you to find one that you love to make this scarf. In fact, it’s so quick to stitch up that you could make few if you like. Wash and dry your fabric. Knit fabrics are a bit different than quilting cotton in that they need to be pre-washed and dried before you use them. 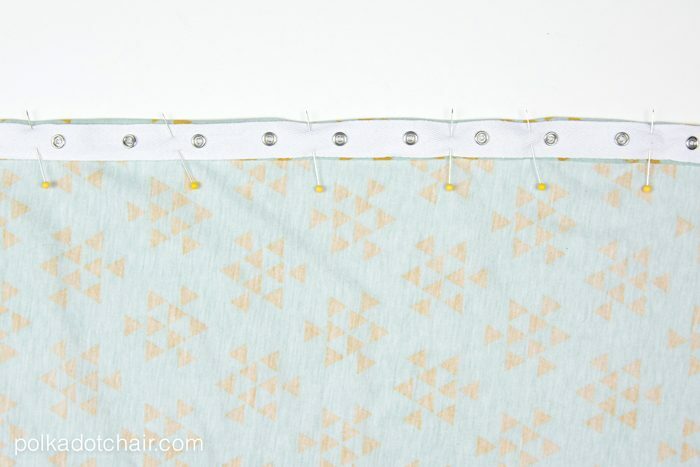 Cut your knit fabric into a rectangle that is 28″ wide by 58″ (or the width of your fabric). 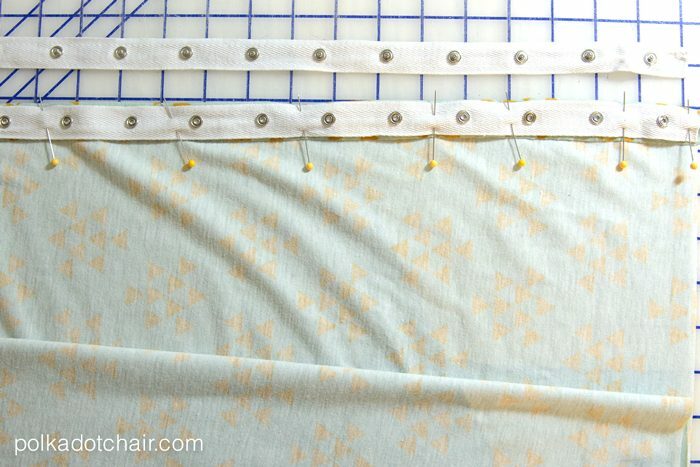 Cut the selvage edges off of your fabric. Fold under one of the 28″ sides of the fabric 1″. The wrong sides of the fabric should be facing. Separate the snap tape. 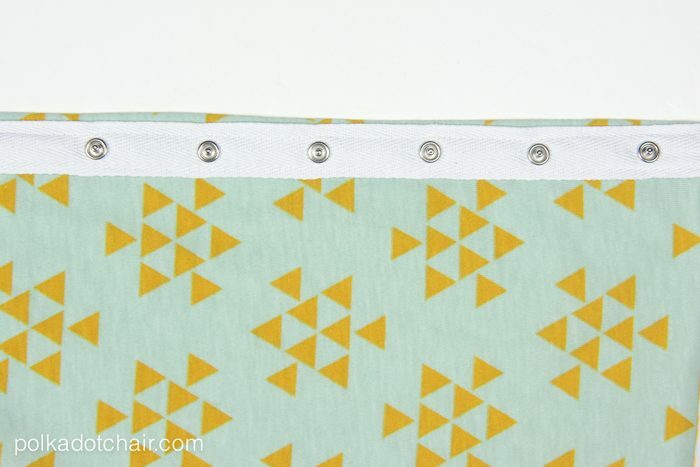 Pin one side of the snap tape to the fabric on top of the fold. Double check that you have the correct side of the snap tape facing up. Have the tape about 1/16″ from the fold of the fabric. Pin well. Install the zipper foot on your sewing machine. Stitch the snap tape in place along one edge of the tape. You’ll need your zipper foot so that you can keep the foot of the sewing machine out of the way of the snaps. 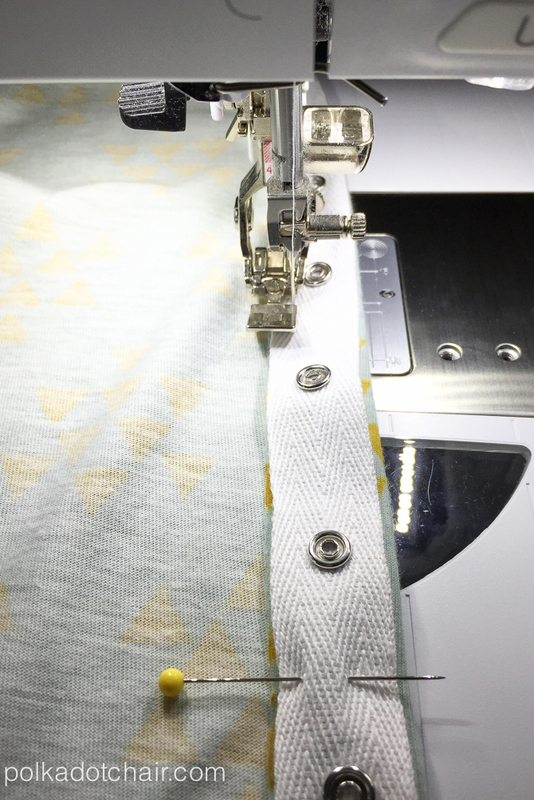 Repeat for the other edge of the snap tape (you may need to move your needle or readjust your foot depending on your sewing machine). Fold the other 28″ side of the fabric down 1″. With the wrong sides of the fabric facing. Pin the other half of the snap tape to the RIGHT side of the scarf on top of the fold. 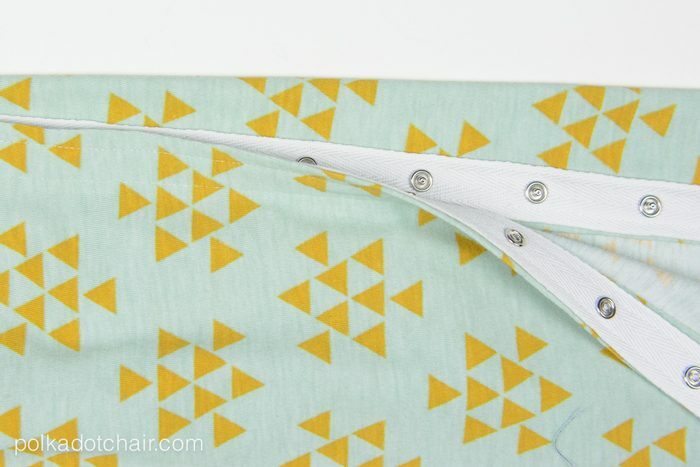 Make sure the correct side of the snap tape is facing up and that it lines up with the snap tape you stitched to the other side. Stitch in place the same way you did in step 3. Trim edges even. Clip strings and you’re done! Since knit fabric does not fray there is no need to hem the long edges of the scarf! That is just too cute. I hope I get a chance to make one. I am always a little too chilly by the end of our outdoor theater excursions, and this would be perfect. This is so cute! And sooo functional! I love it – gotta try it out. I do have one question – why one yard of fabric, if the pattern is only 28″? To allow for shrinkage when pre-washed, I would imagine. Some knits really have some serious reduction/shrinkage!! This is my first project with knits and it was really difficult. I have been quilting for a long time, but found this challenging. I would have appreciated some advice on HOW to square up knit fabric because it acts nothing like quilting cotton. In clothing class I was taught that you ALWAYS must find the staright of grain before starting any sewing project. On knits you simply hand baste down one of the ribs. On wovens you pull a thread on the cut edge until it runs the width of the fabric. I thought every sewer always found the grainline but the more online tutorials I read the less I see grainline mentioned. I bet this would work great as a breast feeding cover too! Where can I get that fabric? Where would I find snap tape? I just finished this and wanted to see if you had any advice. The snap tape is much heavier than the knit and I can’t get it to look right when I put it on. The snap tape bunches up and creates a large bump. Any tips on how you should wear this? Did you steam it with your iron well? Knit has a tendency to bunch up and “ruffle” a bit when you sew it. A good pressing with a steam iron will really help. When I wear mine I put it on with the snaps done up and the snaps facing the back of my neck. I then loop it over my head. Hope this helps! I used Heat’n’Bond, which comes in a 1″ wide roll. It’s a bit too wide so I cut 2 strips the length of the tape, and then trimmed a scant 1/4 or less off of one long side. It comes with ironable paper on one side. Put the fusible side down, iron, then let it cool a few seconds. Then peel off the paper, and lay the tape down on it. I pressed in between the snaps for several second, pressing down. This is just enough to stick it on. Then I put a towel down on the ironing board, and laid the snap tape face down on it, to help pad the snaps. Then I pressed the back of the tape through the knit fabric, longer enough to really seal the bond. This holds it enough to keep it still and not bunching up when I stitched it. The fusible heat-n-bond also sealed the cut edge of the knit, so I didn’t actually fold that end over before applying the tape. I’ll see if this lasts looking good enough. Next time I might try the told. Hi, I used heat-n-bond, which comes in a roll about 1″ wide. I cut two strips the length of the tape. The heat-n-bond, which is fusible, is a bit too wide so then I trimmed a scant 1/4″ from one long edge of the heat-n-bond. It comes with paper on one side. I applied it along the edge where the tape would go, with my iron. Let it cool a few seconds, then peel off the paper. Then I applied the snap tape, pressing in between the snaps for a few seconds. This was just to get it to stick a bit. After that, I turned over the fabric with the tape fused on the ironing board, but on top of a clean bath towel. This was to pad the snaps a bit. From the back of the fabric, I finished fusing the snap tape to the edge of the scarf. Repeat other side. I trimmed off any bit of the fabric that stuck out from the edge of the tape, as I opted not to fold over the fabric as in the tutorial. The heat-n-bond fuses right up to the edge. I’ll have to see if this keeps the edge neat. Next time possibly I would go ahead and fold the fabric first. Thank you for the suggestion. Did you sew the snap tape down at all? I’m just wondering if it would come loose after snapping and unsnapping it a bunch of times. This is just like a nursing scarf that costs $55 to buy, but so much cheaper to make yourself, and you can pick such cute fabrics! You can wear it as a scarf, vest, poncho, shrug, tunic. I haven’t started my scarfs yet but am wondering why bother with the stap tape at all? Can’t you just open the scarf and put it over your shoulders without the snaps? The snap tape is expensive. The 40% coupon always available at Hobby Lobby makes the snap tape extremely affordable. I folded the 1.5 yard fabric in half lengthwise, sewed around edges, leaving hole for turning then added snap tape to the finished ends. This came out so nicely that I may make some as Christmas gifts! I saw this and new I wanted to try it (with the help of a talented seamstress). Needless to say I’m thrilled with the result. I can’t wait to travel with it, for now it will keep me cozy while I read. Thank you for this tuto, I put it in my to do list. This is an awesome idea! It’s also good for nursing moms; discrete, fashionable, and just plain beautiful!!!! After this is sewn together, how do you twist it? Im not very good at working the infinity scarfs, so I need a little visual.lol thanks! It just snaps together. You can snap it together then twist it or, just leave it unsnapped and wear it. I found 28″ to be way to narrow. I can’t loop it and it bunches. Not sure where I went wrong. 28″ is the width. 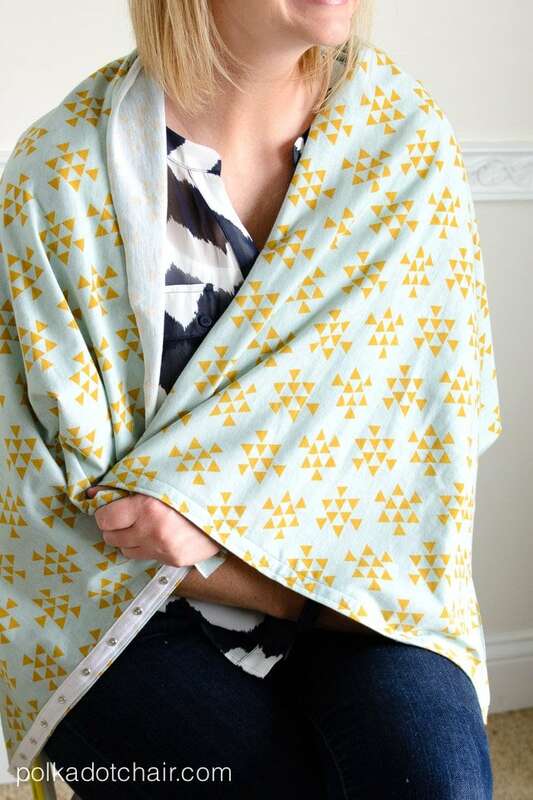 The length should be the width of the fabric as it’s sold (which should be close to 60″)- did you cut it to 28″ x 28″?